Last Friday night at dinner, I had a moment of weakness and ordered a new Samsung ChromeBook 550 with overnight Saturday delivery from Amazon(s amzn). Did I need the device? No. Do I have last year’s ChromeBook? Yes, in the form of a loaner device and I’ve been using it for a month. So what was I thinking by plunking down $449 for yet another piece of hardware? I was intrigued by all of the upgrades over last year’s model in conjunction with the new ChromeOS (s goog) software updates and I wanted to see how much the experience is improved by new hardware. I should have these lapses in judgement more often because I’ve been having a blast with the new ChromeBook. Before I go on a little more about the experience, let me preface any “but it can’t run apps” or “I can’t do [INSERT ACTIVITY HERE]” comments by emphasizing a point from the video. Since we all have different needs, I’m not suggesting that a ChromeBook is the future of computing for everyone. Instead, I posit that it’s one future of computing. For some, this device won’t work, while for others, it can be a liberating tool. How so? I’m finding that without any possibility of falling back to native or third-party apps, there’s a world of web activities I hadn’t found before. Obviously streaming a Netflix(s nflx) or YouTube video on the ChromeBook isn’t new, but I did find several fun games to play. (Get your Angry Birds here!) I sleuthed out some image-editing tools online, even though ChromeOS now has a basic photo editor as well as easy access to saved files. And I even found a way to use my 1Password app through the web. Perhaps the best aspect: I can quickly get to work online — this boots and wakes faster than my MacBook Air(s aapl) — and not be pestered by app notifications. The ChromeBook lets me stay focused because it can’t run apps. If want notifications, I can enable some in my extensions; same as with an apps. I suppose I could just not run apps on a traditional computer to accomplish the same thing, but I still find it too tempting to have access to those apps. If I really want to cheat, I can use the Chrome Remote Desktop beta tool as shown in the video when I connect to my iMac from the ChromeBook. So far, I’ve found the new ChromeBook to be highly portable, more fun than I imagined and much more capable over last year’s model. The extra memory and better processor yield a laptop-like experience without the extra baggage provided by a full desktop operating system. Again, if you want a full, traditional platform to use; don’t look here. But if you’re game to try a new experience — and your computing needs are mainly web-based; particularly with Google — then it’s time to try a ChromeBook. Kevin, you mention: And I even found a way to use my 1Password app through the web. This is the ONE feature I am having a hard time living without. Can you tell me what you did? Frank, you can store your 1Password file on Dropbox instead of on a local computer. It’s obviously a personal decision to do so in terms of your security comfort level. ;) If you do, however, you can access your passwords through a web interface that unlocks with your master password. By remotely accessing a PC or Mac running Office, yes, but you can’t install Office (or any other apps) on a Chromebook. please upload your videos to youtube, it is a pain to wait. Love this review. Inspired me to do my own. I received my Chromebook this week. I was skeptical, but the interface is fantastic, the speed is amazing and it’s opened my eyes to how much I NEVER use resident applications. As well, it’s been so much fun finding cloud programs that do what I typically need a program to do. G+ including Drive inclusive of storage, a word-like program, a powerpoint-like program and an excel-like program are amazing, as well as the photo editing functions available from the former Picnik team. All in all, great machine, already use it way more than my iPad, Macbook Pro and even my iMac. Happy to answer ANY questions folks have. Look! If I wanted to plunk nearly $500.00 on a device that uses products leftover from the 1990s, I would go buy something from that time period that actually lets me enjoy gaming and various web formats. It’s waaaay overpriced for what you get! It’s 2012, not 1995! My sister just had a Chromebook 550 and the built-in mic in not working with GTalk or G+Hangout. Strange… as it looks to work pretty well on your video. Any idea how to solve this issue? Great Video Kevin. I was thinking of getting the Acer Chromebook, but my big concern is the 1.66 GHz dual core Atom. I’m not a techy, but I thought you needed 2.0 GHz or more to have quality streaming? I would want to use this to stream tennis on ESPN to my HDTV, & would like to know if it’s fast enough? Domenick, I use the ChromeBook to stream both Netflix and 1080p YouTube videos and it works flawlessly. I haven’t tried to pipe that to my HDTV and I’m on the road until tomorrow, so I can try streaming ESPN when I get back from traveling. Your Samsung ChromeBook doesn’t have an HDMI port, but a VGA. I’m curious to know how that will show up on your HDTV. (picture quality & frame size) Do you need some type of converter to use VGA on a TV? Is there a reason you chose Samsung over Acer? I’m glad that you pointed out the key point that Chromebooks are not intended for everyone. Too many people trash the Chromebook concept beacuse of what it can’t do, instead of focusing on the advantages it has for certain types of users. As you mentioned, if you’re looking for an easy to use, easy to manage device, and most of your time is spent on the web anyway, then Chromebooks are a very attractive option. Great point. That’s something that’s often missed when looking at a product: who it’s for and what is the intended use. For someone reliant upon traditional PC apps, the ChromeBook won’t work well. But for a web-centric user, it delivers. Thx! Toryander, that’s a very valid thought and one that I suspect many potential ChromeBook buyers have. Here’s my $0.02. Yes, you can buy a full computer with more features and functions at this price. But you also get more complexity to deal with, slowness (this ChromeBook is fast for what it does), and probably not as good an experience than if you spent more for a computer. The ChromeBook eliminates much of the “stuff” you don’t always need with a full computer: Simplicity and speed are features you’re getting with this device. I feel like it’s the same kind of argument that occurs when choosing tablets over notebooks. There are trade-offs. It’s possible to buy a much cheaper laptop, but the build quality and speed won’t be anywhere near a Chromebook. If your life revolves around MS OFfice and you can’t adapt to Google Apps or Office 365, a Chromebook will make you miserable. If, like me, your work and play are already “out there,” things will be easier. I generally spend my whole day in a browser and can count the number of times I’m out of it on one hand every week, and quite possibly in a month (excepting SSH, which is available as a Chrome App). I bought a nice aluminum-body, 13″ Atom N525 notebook for about US$230 on the last day of Computex, and installed ChromiumOS on it. It had a 320GB HDD, not an SSD. It’s still blazingly fast. There _are_ issues because Flash and GTalk aren’t included in the OSS version, and the webcam isn’t working, but this adventure has convinced me to buy a Chromebook literally the _second_ they become available in Taiwan. What did you miss ? If you had to get thorugh an entire week with just the Chromebook, What is missing ? Who cares about boot times today? I reboot my Windows 7 laptop only when an update or installer requires it. Wake time is around 5 seconds, this includes typing password. This with a HDD. My other laptop with SSD boots to Windows 7 in 20 seconds. By that time I have Skype and browser running. The Chromebook wakes in literally the time it takes you to open it. It’s not “instant,” but it might as well be. I don’t know what to say. Kevin said “Iâ€™m not suggesting that a ChromeBook is the future of computing for everyone. Instead, I posit that itâ€™s one future of computing. For some, this device wonâ€™t work, while for others, it can be a liberating tool.” Still, the comment section fills up with the normal, negative comments that any review of a Chromebook gets. It’s tiring. Chromebooks are good for some people. Those people know who they are. Chromebooks are an even better choice for small businesses and schools which are heavy Google Apps users, where the “managed IT in a box for almost free” part of Chromebooks really presents a lot of value. For businesses and schools based on MS products, Chromebooks are a waste, and no Apple school needs to think about other hardware. It’s good for some. Not every person has the same needs and desires. Deal with it. Hey Kevin, thanks for the great review. I’ve long been tempted to get a ChromeBook but I have one issue that I suspect you might too, given that you’re also a Strava user. I see the device you reviewed has two USB ports. Did you come up with some way of uploading data from a Garmin fitness device directly to Strava? Perhaps the Garmin would just mount as an disk drive, enabling you to browse for the activity file? Chrome OS looks interesting. Unfortunately the hardware seems way off in terms of price. I could be wrong but I believe I have seen Win 7 laptops with similar or better specs for just over $300. Granted you are getting a fairly awful laptop but that price but they do exist. Being Linux is this build available from Google for download? Please can you post a link to this $300 Windows 7 laptop with similar or better specs? I have looked around, and I can’t find any Windows laptops of equivalent spec for just over $300. Sure you can get a shoddily built and painfully slow el-cheapo Windows 7 netbook with 1GB Ram, single Atom CPU, cramped keyboard and 1024 x 786 screen and 2.5 hours real battery life. However that isn’t anywhere near the spec, CPU speed, RAM, build quality, continuous use battery life of the Chromebooks. 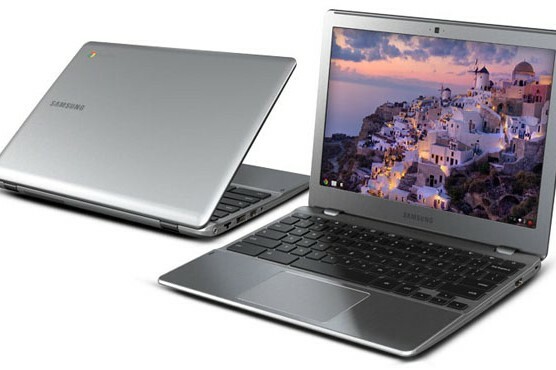 The Samsung 550 Chromebooks are admittedly $50-75 higher priced than they should be for the spec and build quality, but the original Chromebooks and new Chromebox are priced competitively with any Windows 7 laptop or Windows desktop of equivalent build quality and spec. I suspect the raised price for the Samsung 550 Chromebooks are there as a temporary measure until stocks of the older Chromebooks are cleared. I enjoyed this video a lot; it’s cool to see the Chrome platform is maturing even though I do agree that it’s not a fit for everyone. Great video Kevin, and a pretty useful gadget for those who need only a web interface. The biggest downside is that you can grab a 10″ netbook or 11.6″ ULV SB for around the same $440 and get a TON more features and functionality – better bang for your buck! It is true that you can get crappier Windows 7 netbooks/laptops (slower, smaller screen resolution, low battery life, and/or poor build quality) for less than the price of a Chromebook, but I have searched very widely and found that if you are looking for something of equivalent spec, it is difficult to find an equivalently spec’ed Windows netbook/laptop for less. Chromebooks and the Chromebox are competitively priced – except maybe for the new Samsung 500 Chromebook which is about $50-$75 higher than it should be – maybe to allow stocks of older Chromebooks to be cleared. Acer AC700 11.6 inch Chromebook (Intel Atom N570 1.66GHz, RAM 2GB, 16GB SSD, LAN, WLAN, BT, Webcam, Google Chrome) 6 hours continuous use battery life – Â£279 from Amazon. Windows 7 11.6â€³ ULV SB like Acer Aspire 1410 with Intel Celeron ULV 743 and 2GB RAM with premium battery to give 6 hours non-continuous battery life – Â£430 from Amazon. 1)The Windows ULV laptop requires a bigger battery to give the same battery life on account of the higher power consumption under of the Window OS due to more CPU load imposed by Windows. 3) The Chromebook has a fast (8 sec boot time) and rugged 16GB Solid State Drive (as found on high priced Macbooks and Ultrabooks), while the Windows 7 laptop had a cheap and slow 160GB mechanical hard drive. OK so that gives you more local storage on the Windows 7 laptop which is required for Windows to work, however Chromebooks don’t any more that 16GB local storage since they don’t store user data locally or install applications locally like Windows, so any more would go unused. What is more is that for Â£56 extra you can buy a 500GB external USB mechanical hard drive and trump the Windows 7 machine with fast 16GB SSD for the OS, and more and removable 500GB HDD as well for Â£279+Â£56=Â£335 compared with Â£430 for the ULV Windows laptop. There are of course other options and other laptops, but my point is that there is an awful lot of completely bogus and clueless fanboy rants about how you can get equivalent spec’ed Windows desktops/laptops/netbooks for less than the price of Chromebooks/Chromeboxes, and many clueless journalists have picked these rants up in blogs and regurgitated them in reviews. They are simply not true. Chromebooks/Chromeboxes are competitively priced for the spec, battery life and build quality that you get. If you don’t like Chromebooks/Chromeboxes or think other people shouldn’t buy them for some other reason then that is another issue. Why wouldn’t you just get an ipad? Seems silly. Some (many) do not like typing on an iPad. And in order for me to use a keyboard I have to shell out an additional $80-$100 for a QUALITY keyboard. Oh, and I guess I’ll also need a stand or case of some sort. There’s another $40. So in total I just spent $640 minimum for an iPad. Oh…and I still have to use the touch screen to navigate and to click on links and other things. Seems so obnoxious to me. Plus that’s potentially 3 separate items I need to carry around with me. Oh, and I also need batteries to run a blue-tooth keyboard. That’s somewhat annoying as well. Need any more reasons NOT to use an iPad? These things are what just about every Grandma needs. Would save us semi tech literate relatives hours of borderline IT support. You mention the Google Video to Skype bridge. How did you do that?